Music is a unique form of communication that can change the way pupils feel, think and act. Music forms part of an individual’s identity and positive interaction with music can develop pupils’ competence as learners and increase their self-esteem. Music brings together intellect and feeling and enables personal expression, reflection and emotional development. As an integral part of culture, past and present, music helps pupils understand themselves, relate to others and develop their cultural understanding, forging important links between home, school and the wider world. 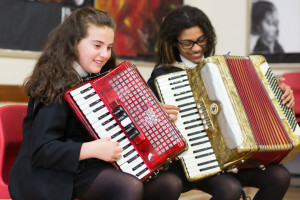 In the final unit of Year 8 there is also a chance for more able pupils to develop their computer skills and work on more advanced musical software which can often prepare pupils for GCSE music. The Key Stage 3 course is designed to help pupils understand themselves and relate to each other by developing students ability to listen, work as a team, perform both individual and as a group, compose in a variety different genres/styles while being able to appraise others and their own work. All pupils will also have the opportunity to continue and develop on-going singing skills at various points of the course. Home learning takes two forms in Music, practical tasks and written tasks to be completed in school and as home learning. On occasions pupils may be set larger pieces of home learning every couple of weeks to complete over a longer time, or it may be split into shorter tasks. This could involve researching, composing, completing worksheets to practical group work and listening to musical extracts. prize giving events and other college occasions. Support for less able students comes in several forms in music, (Eg. Visual, Auditory, Kinaesthetic Learning) according to learning styles, differentiated worksheets including writing frames and keyword lists, aural appraising and feedback, more opportunities for practical lessons in smaller groups, visual demonstrations of a task and chunking of learning. At home parents can support their children by listening to your son/daughter rehearse for a practical performance, accessing the VLE, reading through their home learning and supporting them with listening tasks and introducing them to a range of musical styles and genres. One solo and one ensemble performance lasting no more than five minutes for each. Performance assessment will be conducted regularly throughout the course and the best performances will be retained for submission. Performances are internally assessed and moderated by the Examining Board. During the course, students will explore three strands: Popular Music, World Music and the Western Classical Tradition. At the end of the course, students will sit a one hour exam in which they will respond to questions based on short musical extracts from the three strands. Students will be given 20 hours of controlled time in which to compose one piece of music which relates to one of the three strands studied for the Listening and Appraising unit. The composition will be submitted as a score, recording and annotation. 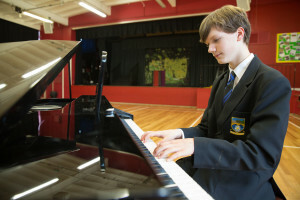 Students will be given 25 hours of controlled time in which to compose one piece of music. The composition will be submitted as a score, recording and annotation. recognised exam board at Grade 3 standard or above. suit their strengths. The course will suit any student who enjoys music – whatever the style. Career possibilities using music cover a wide area. As well as the more immediate ones such as performing and teaching, others include composition, musical instrument manufacture and repair, military musician, sound engineering, publishing and printing, work in radio, film and television, arts administration, community work, music therapy, journalism and librarianship. Students can also go on to study additional Music courses such as ensemble skills and band leadership as well as Music Sixth Form courses.